8 Health Benefits of Strawberries | Eat This! Everyone knows that strawberries are delicious. However, did you know just what a nutritional powerhouse they are? Here are eight reasons to include strawberries in your diet. Here are 8 health benefits of strawberries. 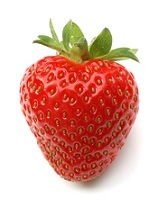 One cup of strawberries contains over 13% of the RDA of dietary ﬁber, yet only 43 calories. The dietary ﬁber in strawberries helps to keep digestion regular, as well as lowers blood pressure and curbs overeating. Strawberries contain a chemical compound called phenols. Anthocyanin, a particular phenol abundantly found in strawberries, lends the rich red color to the fruit. Though anthocyanin is known to have antioxidant properties within the fruit, it is debated as to whether the antioxidant agents in anthocyanin-rich foods can be absorbed into the body once digested. Fortunately, however, it is known that when anthocyanin-rich foods are consumed, the body’s uric acid levels increase, which serves as an antioxidant agent. The phenols in strawberries also ﬁght against many inﬂammatory disorders, such as osteoarthritis, asthma and atherosclerosis, by inhibiting the enzyme cyclooxygenase (COX) in the same way that the drugs aspirin and ibuprofen do. Strawberries, however, do not carry unwanted side effects like stomach and intestinal bleeding. The combination of antioxidant and anti-inﬂammatory agents found in strawberries is well-known to ﬁght against the onset of many different forms of cancer. Thanks to the vitamin C, folate, and the ﬂavonoids quercetin and kaempferol that they also contain, strawberries are a delicious defense against potentially cancerous cells. The Archives of Opthalmology recently published a study in which three or more servings of strawberries (and other fruits) per day can decrease the possibility of contracting age-related macular degeneration by over one-third. One cup of strawberries contains an incredible 136% of the RDA of vitamin C, an effective antioxidant that can help lower blood pressure, ensure a healthy immune system, and ward off the development of age-related ocular diseases, such as cataracts and macular degeneration. One cup of strawberries contains 21% of manganese, an essential nutrient that acts as a powerful antioxidant and anti-inﬂammatory agent. By increasing the levels of superoxide dismutase (SOD), the enzyme responsible for protecting mitochonrdria exposed to oxygen, manganese not only helps to ﬁght the battle against free radicals and oxidative stress, but also lessens cellular inﬂammation — another cause of numerous cardiovascular diseases.